Michael Taylor Shot, Killed in Albany Convenience Store; Was This Tragedy Preventable? Could this tragic Albany convenience store shooting have been prevented and is justice available to Mr. Taylor’s family? 26-year-old Michael Taylor was reportedly shot and killed while heroically attempting to stop a fight inside a convenience store Saturday evening, May 19, 2018. 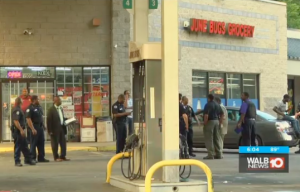 According to WALB 10, two men “were fighting inside [a] Convenience Store in the 1900 block of South Madison Street” when the altercation escalated into gunfire. Police told FOX 31 Mr. Taylor was an “innocent bystander,” caught in crossfire while attempting to break up the fight. Tragically, he succumbed to fatal injuries. Was negligent security a factor in the death of this heroic young man and could this incident have been prevented? Read Our Legal Take below to find out if Mr. Taylor’s family may have legal avenues for justice and claims for substantial compensation in Georgia. Gas station and convenience store patrons have a right to feel safe and secure while on the premises. The Murray Law Firm questions the level of security provided at the subject property and whether this tragedy may have been prevented. Have there been prior incidents of violence on or near property? What security measures, such as metal detectors, surveillance cameras and security personnel, were in place to deter crime and protect Mr. Taylor at the time of the shooting? Were authorities called at the start of the initial altercation? By law, property owners in Georgia are required to protect all those legally on the premises from any foreseeable harm. Should the facts of this matter reveal that the business owner or management failed to provide adequate security, the family of Michael Taylor may seek justice and elect to pursue legal claims for their loss.